Registration for the 2018-19 first year math circle will open in mid September and will be announced through our mailing list. The Math Circle will meet every Thursday, 5–7 PM, on the UW campus in Savery Hall. The last meeting of the winter quarter was on Thursday March 14th, 2019. The first meeting of the spring quarter will be on Thursday April 4th, 2019. First Year Circle (Grades 7-8) – Smith 164. Second Year Circle (Grades 8-9) – Smith 157. What is UW Math Circle? The UW Math Circle is intended for Seattle-area 7th, 8th, and 9th graders with mathematical minds, with the intent of continuing their development in this direction. The students meet weekly in the Math Circle to engage in a variety of activities. Here, we develop many areas of mathematics, including (but definitely not limited to) logic, graph theory, combinatorics, and geometry. Follow the links at the top of the page for a more detailed breakdown of what's being covered in each meeting. To reinforce the lessons learned at each Math Circle, weekly homework assignments are given at the end of the meetings. The students are encouraged to delve even further than the problem statement, in order to really get a feel for the solution. To reinforce this behavior, the first hour of each meeting is spent by the students explaining their solutions and methods to their peers, with the listening students free to critique the solutions and offer help when things get confusing. The last half of the meeting is spent covering new material. We introduce the concepts to the students with a major emphasis on hands-on activities. For the students, this means that much of their time is spent actively engaging in problem-solving, with ample time to ask probing questions to their colleagues and the instructors. We currently offer two math circles: The first year circle and the second year and beyond circle. The first year circle is designed for students who do not already have UW Math Circle experience. Registration for the first year circle opens in the beginning of September and is announced through our mailing list. Successful participants in the Math Hour Olympiad are given priority; the remaining slots are distributed on a first come first served basis. Upon successful completion of the first year circle, students are promoted to the “second year and beyond” circle where they can study for as many years as they find the math circle experience beneficial. The curriculum of the intermediate circle varies from year to year so returning students do not have to worry about repeating the same material if they stay for a third or fourth year. In the past, the UW Math Circle had been offered at no cost, thanks to two grants form the National Science Foundation that supported the Department of Mathematics outreach efforts. The larger of those grants expired in the Spring of 2014. With the majority of our funding now gone, we have to ask families to contribute to the operational expenses of the Math Circle, if they are able to do that. We suggest a donation of $100 per semester. This will cover the very basic needs of the Circle. But any amount your family is able to contribute – large or small – will help. To make a donation, follow this link. Please make your donation by the third week of class in the and then again in the Winter. This will help us with our financial planning. Your donation is tax-deductible and might be matched by your employer. Please talk to Julia Pevtsova if you think this is a possibility. 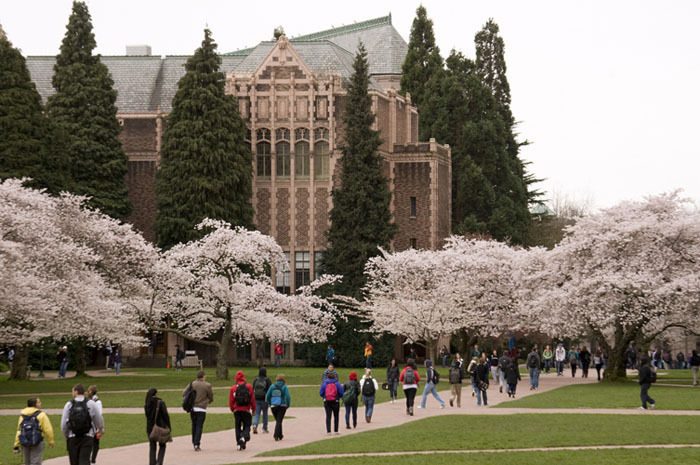 The University of Washington is easily accessible by public transportation from Seattle and the Eastside. Check out King County Metro Transit and Sound Transit for schedules, or use Sound Transit's regional trip planner. 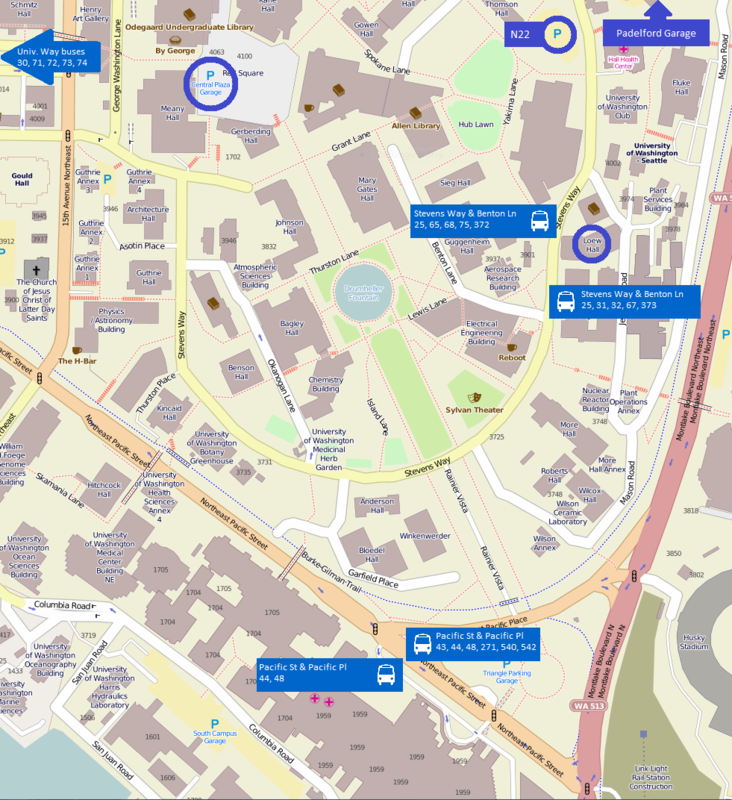 The central parking garage (map) is located near the center of campus. Driving directions to the central parking garage from I-5 and SR-520. You can also park in the Padelford Garage or the N22 lot, both located near Padelford Hall. See here for UW parking rates. The Math Circle at the University of Washington is partially supported by NSF CAREER Grant DMS-095-3011 and NSF RTG Grant DMS-083-8212 and the generous support of anonymous donors.